Variations of the Game BANG! As I was working with a few children in my daughter's classroom, it was evident to me just how much these first graders and kinders LOVED to play the game BANG, but they hated to put their sticks back when they pulled the stick with the word BANG so.....I came up with a cool idea to make this game a bit more interesting and created a few variations of the game. But before I go an further, I want to make sure that you are aware of the game. 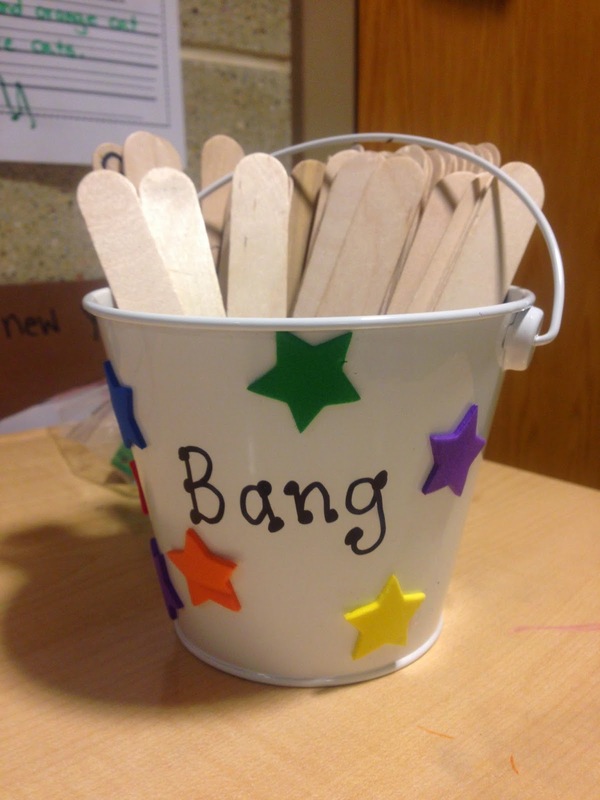 The basic game that I have played with my students over the years is simple: You write the sight words that you are working with onto some tongue depressors or Popsicle sticks and you add a a few sticks about 1 for every 20 words that have the word BANG written on them. The players take turns pulling sticks and reading the words, If they are correct, they keep the sticks. If they are not correct, the sticks go back into the bucket, but if they pull the stick with BANG, they have to put ALL their sticks with words back including the BANG. Play continues in this manner until all sticks with words are pulled or the designated time is up. All the children LOVE to play this simple, yet educational game and they play it during indoor recess, free time and at home. 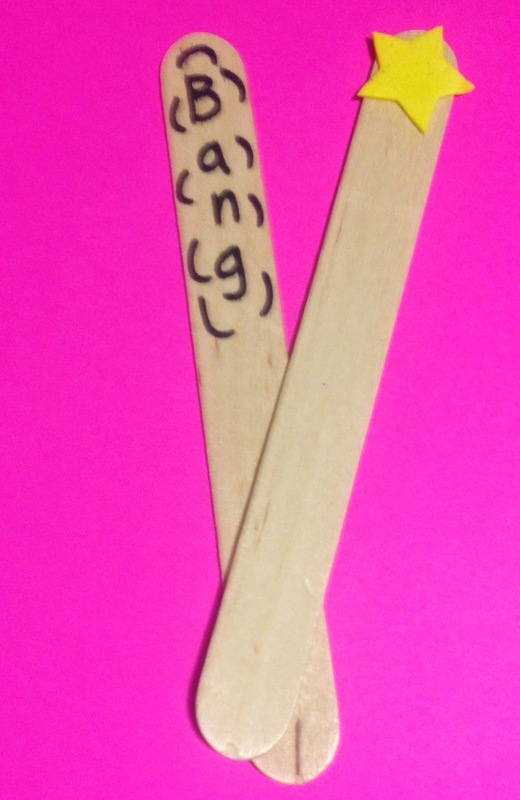 Write upper and lowercase letters on the sticks for children who need letter recognition skills. Put random consonants on the sticks,but make sure you have added lots of vowels so the kiddos can make words with the sticks. As children pull the sticks, they can make words with the sticks. If a player pulls BANG, they only have to put back the random letters that are not a part of a created word. ( You might want to actually make sure that you enough letters CVC pattern to create many words). Write sight words on the sticks in sets 1-50, 51-60, 61-70 etc. and label each bucket with the numbers and actually designate who can play which buckets then the children are using words they need to learn or master. Keeping with this idea, if a child pulls BANG, but they can construct a phrase that makes sense with the words, they can keep the words in the phrase and put back the others. Write numbers on the sticks for a number recognition game. You can label your buckets 1-20, 21-30, 101-120 or what ever numbers they need to know or with which they need work. Write addition facts on the sticks. The players pick a stick give the answer to the fact, their partner checks their answer and if they are correct, they keep the stick. If not, the stick goes back into the bucket. If BANG is pulled ALL sticks go back or add a few star sticks to this as well. Write CVC words to read on the sticks. Write CVCe words on the sticks. Write words with digraphs, bonus letters, vowel combinations, 2 syllable words or whatever your students need on the sticks that can be written and reinforced in this manner. So, what are you waiting for...run to Michael's and get some small buckets, sticks and if you are stuck in the snow like I am at the moment, get out your markers and start creating those BANG games!